Left to right are Ann Wright, AHACC board member; Alan Hicks, WestRock communications analyst; Betsy Carter, AHACC board member. 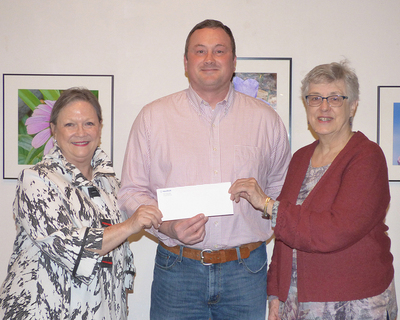 Covington, VA (April 3, 2019) - April 3, 2019– The Covington mill recently made a donation to the Alleghany Highlands Arts & Crafts Center (AHACC) to support the Art of Chocolate Festival on April 6, 2019. The festival will be held at the Historic Masonic theatre from 11 am – 3 pm. Local bakers will be competing for the “Best Of” honors in several categories displaying the use of chocolate. Chocoholics can use purchased ticket books to indulge in chocolate samples, or make plates to go. Attendees will also be able to enjoy chocolate art, bid on Silent Auction items, or relax and enjoy several demonstrations from regional chocolatiers.